A few months ago, Michelle Obama had released her own memoir called Becoming. It has been the #1 best selling book for about 3 months now. To be honest, I didn't really know Michelle. I knew she was married to Barack and that she advocated for being healthy. I also had watched her on Ellen a few times and thought she was a pretty cool first lady. I decided I wanted to read her book, primarily because she mentions that she lets her readers know how it is living in the white house. Being someone who may never get the opportunity to, I thought it would be interesting to hear about how things went on in the white house and how it functioned internally. It's always been some sort of secret and never really portrayed in the media. Instead of purchasing the book, I went to my online library and put myself on hold for her audiobook, which was read by Michelle herself. After about 2 months, I got a notification that the book was automatically borrowed for me and I was thrilled to start reading. I got to know about her childhood and how she grew up. I learned about her going to Princeton to get a law degree. She spoke of her various jobs, including a teacher's aid, unofficial babysitter, and a lawyer. She also spoke of her marriage, Barack's campaigning, their move to the white house, her stay during the white house, and after. To be honest, the more Michelle read about her life to me, the more I found myself that I could relate to her. No, I didn't go to Princeton, but I did get a higher education, which both of us had parents that did not. We both came from nothing and tried our best to make it in the world. She grew up on the South Side of Chicago, living in a small 1 bedroom apartment with her family. I came to America as a refugee with no money at all. As both of our lives progressed, I find that we are more alike than different. I found that through her words, I could relate to her more and how she was just another human being, not the first lady. She talks about a time that she graduated with a law degree, became a lawyer, and then saw herself not being fulfilled with her life. I have been in the exact same situation. She had then taken a job that was a 50% pay cut but only because she wanted to explore other directions in life. She wasn't sure of what it is she wanted to do with her life and I cannot relate more. I know she is older than me and has already passed that stage in her life but being where I am and hearing her story, I know that it will all work out in the end. Michelle talks about first meeting Barack and being curious about him. She talks about the first time they loved each other and their first kiss. She speaks so highly of him and how much he cares for her, knowing when she is upset, uncomfortable, or happy. She talks about the highs and lows of their relationship and how they always managed to work it out. I can relate on all of these points. This blog post wasn't about Becoming Michelle, but rather Becoming Amela. I have gone through so much in my life, but instead of focusing on my hardships, I should be celebrating my successes. Instead of wallowing in pity and despair, I should be looking at the brighter side of life. Michelle brings up the point of how children always look through a positive lens and that's how everyone should be viewing the world. They don't see it through the dark and rough times, but rather the happy moments. They never worry about moments in the future that haven't happened yet, but rather enjoy the moment they are in. I think for 2019 a goal of mine will be to become that better version of myself. I want to be happy and have faith that everything will work itself out in the end. If a door closes, I need to leave it closed and move on. I need to trust that fate will work itself out in the end. I hope you took away something from this. If you are in a situation and frustrated, take a step back and tell yourself that everything will be okay in the end. If you feel like you've hit rock bottom, well I'm here to tell you that they only way to go from here is up. And with that, I will leave you with this.. I hope there are days when your coffee tastes like magic, your playlist makes you dance, strangers make you smile, and the night sky touches your soul. 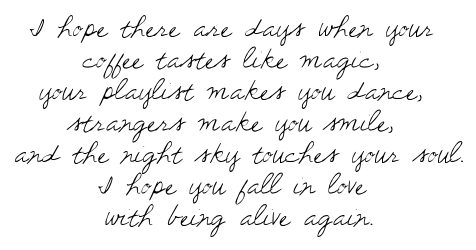 I hope you fall in love with being alive again.